Промышленные двери купить в Алматы. Промышленные двери заказать по выгодной цене - Uni-Tech. Фото, описания, характеристики, отзывы. Доставка по Казахстану. 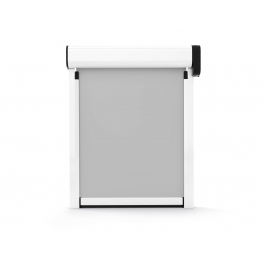 The PVC strip curtains are suitable for separating different working areas and they serve as flexible barriers next to isothermal doors, to reduce the thermal loss or the entry of hot air (to prevent condensation) during the daily operation of opening and closing. Plastic support in dark grey color consisting of a profile to be fixed to the panel by self tapping screws and a plastic covering molded as part of the same support, to cover the structure and to give an aesthetical enhanced result, easy to clean and without sharp edges, (dowels available on demand). PVC transparent strip curtains, dim. 200x2 mm with 50 mm of overlapping. 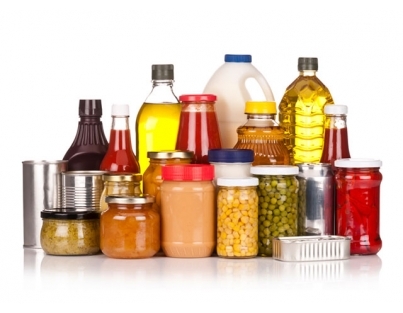 Flexible strip closures in transparent PVC are suitable for creating separate spaces and in particular, as flexible barriers, for use near refrigerator doors to limit thermal dispersion or infiltration of hot air (and the consequent condensation) during the opening and closing of these doors. They consist of a sturdy load-bearing structure in AISI 304 stainless-steel profile sections and of transparent PVC strips with rapid rocking lock and release fitting in stainless steel. 1. Mod. ST 200 x 2, consisting of transparent PVC strips measuring 200 x 2 mm with 50 mm overlap. 2. Mod. ST 300 x 3, consisting of transparent PVC strips measuring 300 x 3 mm with 100 mm overlap. 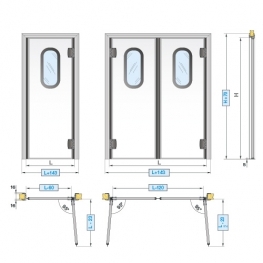 The Transparent Flexible Doors of the CFD series are an effective barrier to the passage of air through isothermal doors in the event they remain open due to intensive traffic, whether pedestrian or trolleys. 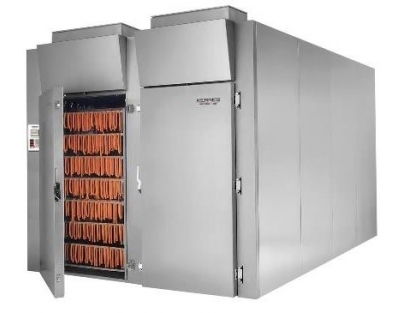 They offer maximum protection against heat loss, controlling energy consumption. 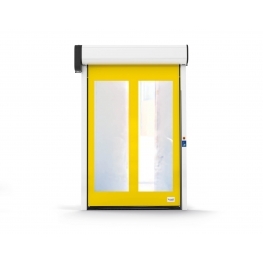 They are also a valid solution in case a dividing door with maximum visibility is required. 1. 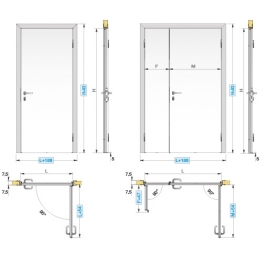 A special stainless steel and aluminium gravity hinge with two-way rotation forms the load-bearing structure of the door. Due to its special design, it closes the door automatically. 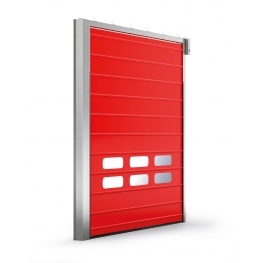 The absence of posts allows optimisation of the door opening, unlike the conventional "FLAP" doors. 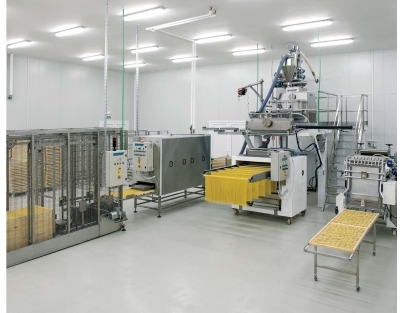 It is much more accessible compared to the traditional Strip Doors as it avoids the hassle of strips that fall against the operator, so passage is easier even when the user's hands are full. 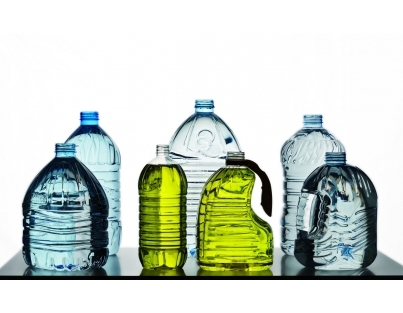 They are easy to install and virtually maintenance-free. The flap doors in PVC (flexible doors), available in a double-door version, consist primarily of a sturdy structure in galvanised steel (painted or optional stainless steel) that sustains a flexible skirt of transparent PVC, suitable for use with positive temperatures or, upon request, with low temperatures, conveniently reinforced in high-stress points and complete with a torsion-spring reclosing mechanism. 2. Pneumatic touch, complete with actuation device consisting of two-way pneumatic pistons that allow the doors to open with a light push, in both directions, with a spring catch. 3. Electro-pneumatic, complete with actuation device consisting of one-way pneumatic pistons that allow the doors to open, in a single direction, following the activation of a remote control such as a photocell, radar, metal detector, button or pull-cord, with a torsion-spring reclosing system. 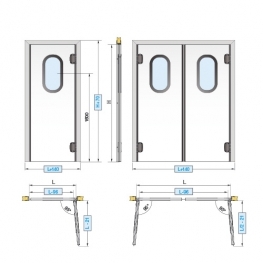 Rapid Fold door suitable for positive temperature between 0° and 35 ° C. The door is CE certified according to EN 13241-1. It belongs to class 2 for wind pressure resistance. Max width of 6.2m and max. height of 4.6m. The primary safety against crushing is a safety edge. 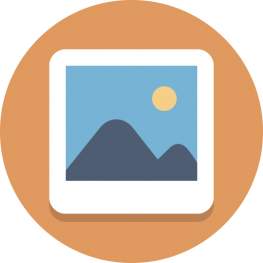 Secondary safety is ensured by photocells with sender/receiver technology installed on the frame. The sheet is in PVC coated fabric (weight 930 gr/m2). Transparent windows in Cristal. The motorgear is provided with encoder, safety catch device, and crank to open the door manually. Opening speed 1 m/s closing speed 0,8 m/s. Frame: galvanized sheet. The electrical control box is IP65 of painted metal sheet, complete with inverter, emergency button and pre-wired main switch. Control box power supply 380V 50 Hz. Accessories: 2 black buttons Ø80 mm for supplementary opening. 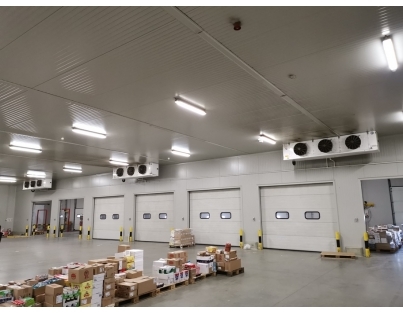 Rapid roll up door suitable for negative temperature between -5° and -25 ° C. It is self-repairing, in case the sheet comes out from the guides it will return inside the guides on the next opening. 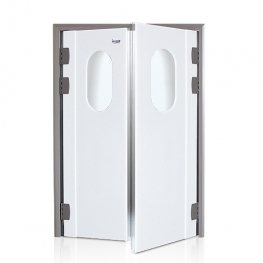 The door is CE certified according to EN 13241-1. 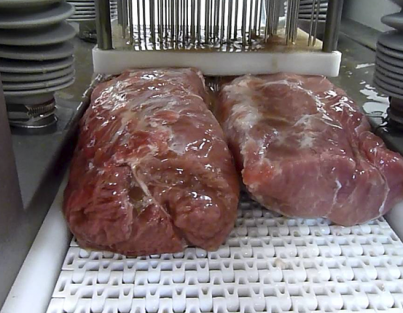 It is Silent: The sheet flows into guides provided with a brush system. The safety against crushing is ensured by an optical safety barrier with Sender/receiver technology. Sheet: insulated, suitable for low temperatures, ice-free. Heating system on the side frame and on the upper guide. 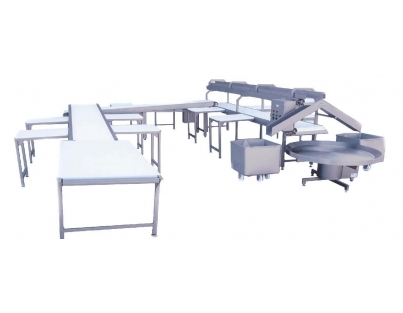 The motorgear is provided with encoder, safety catch device, and crank to open the door manually. Opening speed 1 m/s closing speed 0,8 m/s. Frame: folded steel sheet and epoxy white painted RAL 9010. 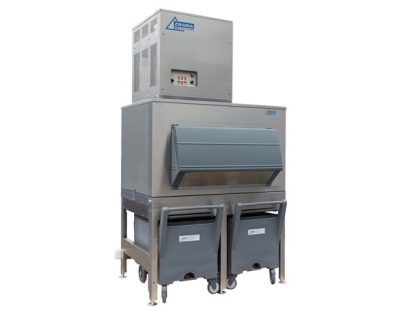 The electrical control box is resistant to impacts, complete with inverter, touch screen display, exclusive Incold software, emergency button and main switch. Power supply220V 50 Hz. 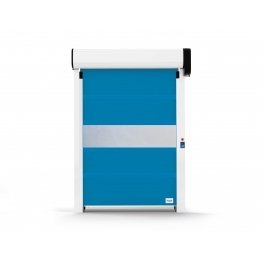 Rapid fold-up door for positive temperature installations between 0° and 45° C and indoors. Self-repairing: in case of shock, hinges welded to the tarp exit from the vertical uprights. They retract on their own at the following opening. CE marked in accordance with EN 132411 standard. Wind resistance: Class 3 (with max diam. 4 metres x 4 metres). The mantle covering is bound to the side uprights owing to a system of hinges welded sideways to the tarp; the latter slide inside the selflubricating polythene vertical guides. Speed: opening 1,3 metres per second, closing 0.8 metres per second. Safety: ensured by light curtain with system consisting of transmitter and receiver, in accordance with EN 12445. The semi-insulating doors of the PVV-PE & PVV-PEG line (to-and-from in high density polyethylene) are designed for installations in air-conditioned rooms with minimum working temperatures > 12 °C, ΔT < 12 °C, U.R. < 60% they can only be used as service entrances and not for uses requiring a hermetic and thermal seal. They can be supplied for installation on panel or brick wall. PVV-F & PVV-FG semi-insulating doors are designed for installation in air-conditioned rooms with minimum working temperatures > 12°C, ΔT < 12°C, R.H. < 60%. 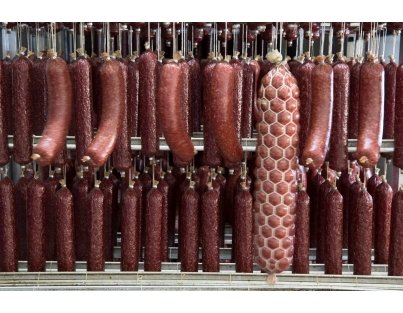 They can only be used as service doors and not for uses requiring a hermetic or thermal seal. 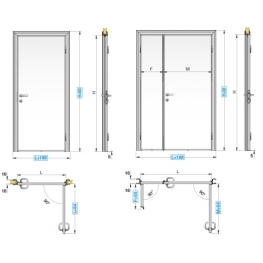 PSI-F semi-insulating service doors are designed for indoor installation in conditioned areas with minimum working temperatures ≥ 12°C, ΔT ≤ 12°C, R.H. ≤ 60. They can be supplied for installation on panel or on brick wall. 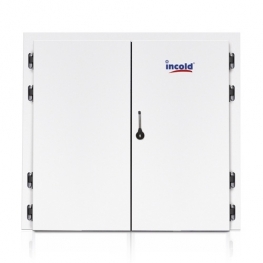 PSI-E semi-insulating doors are designed for internal installation in air-conditioned areas with minimum working temperatures ≥ 12°C, ΔT ≤ 12°C, R.H. ≤ 60%.